Start out in whatever style you are most comfortable with. Change to the style required when you are done. Write your paper normally until you are ready to insert your first citation. Make sure EndNote is open. Make sure that the library you have your citations in is also open. If you remember the author or title of your citation, you can search for the citation from within Word. Go to the EndNote ribbon, and click the down arrow by Insert a Citation and click on Find Citation. Type in the information on your citation and click Find. Choose the citation you want to insert and then click Insert. The citation will appear in the text of your document and the full reference will appear in the bibliography or works cited list. 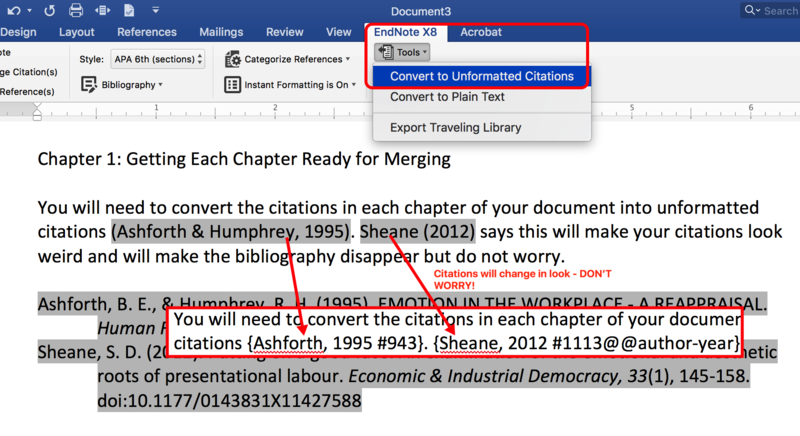 You can also insert citations by finding them in EndNote, selecting them and then inserting them in Word. 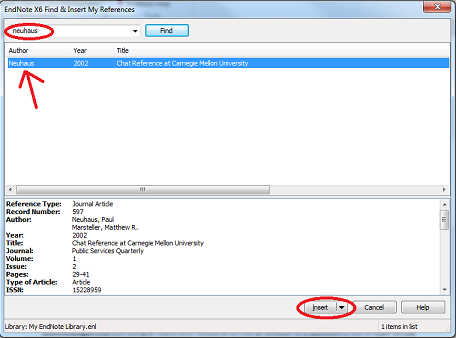 Go to EndNote first, and select the citation(s) you need to insert. 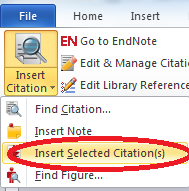 Go to the EndNote ribbon, and click the down arrow by Insert a Citation and click on Insert Selected Ciation(s). 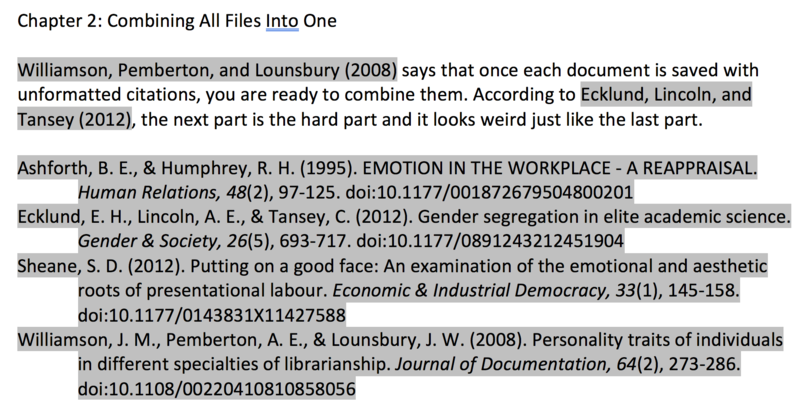 This method can easily insert multiple works into a citation at the same time by selecting several works in EndNote. EndNote can format your So-and-so says citations with the authors listed according to your citation style. When you have found the citation you want to insert, click on the down arrow next to the Insert button. Choose the "Insert & Display as: Author (Year)" option. Choose the citation you want in EndNote and insert it in Word. Click on it and then choose "Edit and Manage Citations" in the EndNote ribbon. Change the format to "Display as: Author (Year)". If you choose to enter the authors' names and only want to insert the date, EndNote can do that. Choose the "Insert & Exclude Author" option. Change the format to "Exclude Author". EndNote can include the author only without the date, you can. Choose the "Insert & Exclude Year" option. Change the format to "Exclude Year". Sometimes things should be listed in the bibliography without being cited in the text, EndNote can do that. Choose the "Insert in Bibliography Only" option. Change the format to "Show Only in Bibliography". In case you need to insert a citation that does not include either the author or year, you must insert the citation and then edit it. Change the format to "Exclude Author & Year". 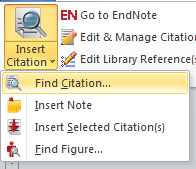 Click on the citation you want to add pages to and then choose "Edit and Manage Citations" in the EndNote ribbon. Add the page number(s) to the Pages field. The pages will apply only to that one in-text citation and will be formatted by EndNote. Don't put p. or pp. before the actual page number(s). Any future citations to the same article/book will not include the page numbers. If you change to a citation style that does not use page numbers, Word will remember the page number but won't display it. Sending a document back and forth between users can make the document lose its connection to your EndNote library. It is best to make a copy and convert it to plain text for others to edit. You can then use your original to make the desired edits in. It is a bit more work but better than having to go back and reinsert all your citations. In the EndNote Ribbon, click on Convert Citations and Bibliography. Choose Convert to Plain Text. This will open a new document. Be sure to save it with a name that indicates it is a plain text version of your document. FYI - Journals usually require a plain text version when you submit an article! In EndNote, Click on the Edit menu, mouse over Output Styles and click on Open Style Manager. Click on "Get More on the Web". From the EndNote Output Styles website, search for the title of your citation style or journal. When you find the one you want, click on the Download button. You may be asked to choose where to save the file. If so, it needs to go in the Styles folder of the EndNote program (for Windows, that is the EndNote folder in My Documents). If you aren't asked where to save the file, open the File manager and move the file. 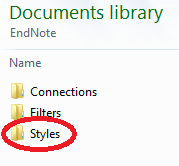 You can check that the file is in the correct folder by looking at the contents of the C://Program Files/EndNote X6/Styles folder in the File manager. You can now close the Style Manager in EndNote and then open it again. When you add a style, the Style Manager does not update dynamically, you must close it and open it again to find the new style. Once you have done that, it should appear in your list and you can add a check to the box next to it so it will appear in your drop down list of styles in EndNote and your word processor. EndNote provides templates for certain styles for an entire paper. You can download these templates from EndNote.com (under Downloads and Writing Templates). The templates are simply Word documents with formatted sections in them that you type in where appropriate. Insert your citations from EndNote as usual. In EndNote, go to the Tools menu and click on Manuscript Templates. Find the template you want and open it. You may get some warnings that the template is not set up for a 64 bit system. Just click through the warnings - it will not harm your computer. You should end up with a Word document open that has sections ready for you to type in. Mac EndNote does not come with the templates. You must download them from EndNote.com. You can save them anywhere you want. You can't open the templates from within EndNote on the Mac so just open them in Word as you would any other document. Open your EndNote Library and keep it open throughout this whole process. In Word, convert each document to unformatted citation. In Word for Windows, go to the EndNote tab, click on Convert Citations and Bibliography then Convert to Unformatted Citations. In Word for Mac, go to the EndNote tab, click on the down arrow by Tools, then click on Convert to Unformatted Citations. Save this a s a new file (I just add the word Unconverted to the document name so I know this is the version that has unconverted citations). Repeat steps 2 & 3 until all your chapters are using unformatted citations. Go to the View tab and click on Outline then Show Document then Insert – you will create this document in outline mode but it will not stay that way. Choose to insert the first chapter you created above (with the unformatted citations) and click Open. Repeat step 7 until all your chapters are inserted into the outline view of the document. Close the outline mode with the button on the right end of the ribbon. Save the document (you will not be able to edit it until it is saved). Go to the EndNote tab and convert the references. In Word for Windows, click on Update Citations & Bibliography. 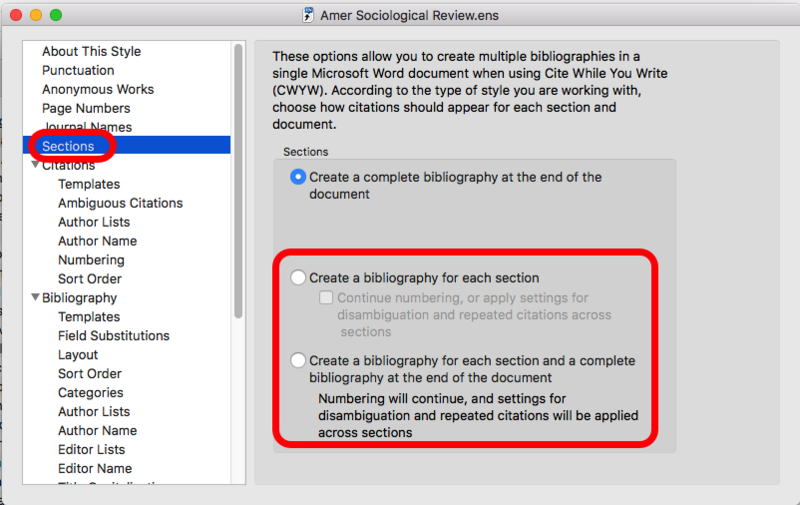 In Word for Macs, click the downarrow by Bibliography, then click on Update Citations & Bibliography. Make any further adjustments and save the document – this should have put all the citations in one list at the end of the file. Double click on the style you want to use to open the style (e.g. APA, MLA, or Journal of Dairy Science). Click on Sections on the left side. Choose the option that best suits your needs - one bibliography at the end of each section or a bibliography for each section and a complete bibliography at the end of the document. Save the style with a name that describes your style by closing it (e.g. Amer Sociological Association Sections). In Word, insert section breaks before each chapter. At the end of a chapter, click on the Page Layout tab, click on Break and then on Next Page under Section Breaks. Do this for each chapter. Click on the Insert Tab then the down arrow by pages and click on Page Break. 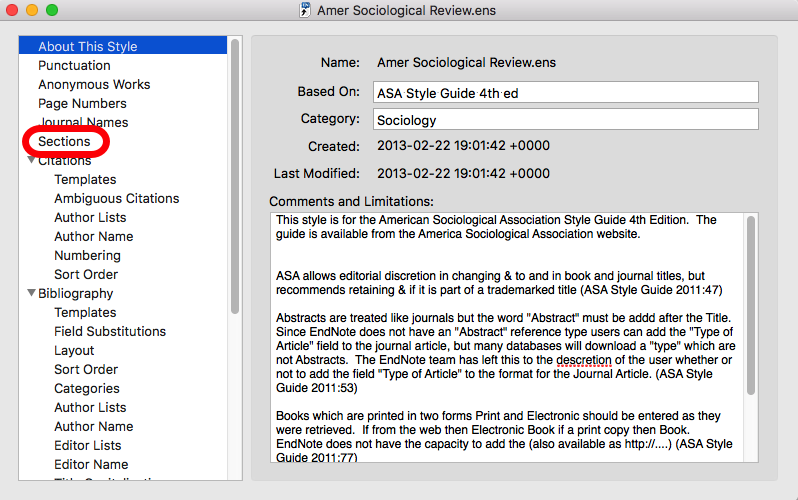 In Word, go to the EndNote tab and choose your sections style. EndNote can be used with LaTeX and BibTex. Use the guide linked below from MIT to help export your EndNote citations into BibTeX. MIT guide for using EndNote with LaTeX and BibTex.